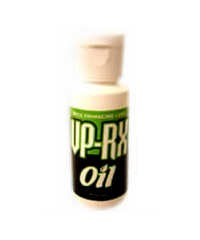 VPRx Oil was specifically designed to be smooth and silky and will not leave a sticky residue. It absorbs into the skin and dries naturally. All the components in VPRx Oil are hypo-allergenic and 100% USP approved for use. The Oil has a light vanilla flavor. Another powerful ingredient is menthol. This ingredient creates an opportunity for the amino acid (which is a relatively large molecule and not normally readily absorbed through the skin) to be absorbed transdermally when applied topically to the skin. This allows for the ingredients to work quickly and effectively in increasing sexual power and sensitivity directly through the skin. The VP-Rx Oil is a very sophisticated personal lubricant. Unlike other oils that are sticky or greasy, the VP-Rx Oil product is formulated to be slippery and smooth when applied - and to stay slippery, smooth, and wet during use. VPRx Oil is water-based so there are no issues with latex condoms and allows the formula to taste much better than the majority of competitive products on the market. The water-base also dries naturally after use leaving no sticky residue or uncomfortable feeling attributed to other lubricant products. All the components in VP-Rx Oil are hypo-allergenic and 100% USP approved for food use. Order Now!